Embolism is a well-known complication of cemented total hip arthroplasty (THA). As a result of manipulations of the medullary cavity, the intramedullary pressure rises and fat, bone marrow and air embolises into the venous system and to the lung. Clinically, this is seen as acute hypotension, which can go as far as cardiac failure. Although a fatal outcome is rare, fat embolism is a serious complication. The most effective prophylactic measure to reduce the risk is a thorough lavage of the femoral cavity. The use of pulsatile jet-lavage can be regarded as an obligatory preparatory procedure before cement application. 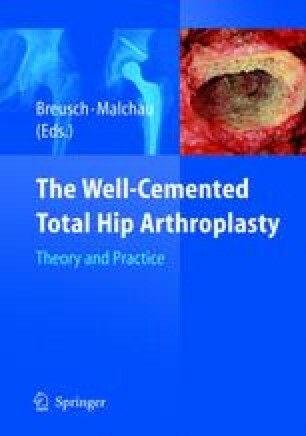 Fat and bone marrow are removed as potential embolic sources and, further, the cement-bone interface is enhanced.